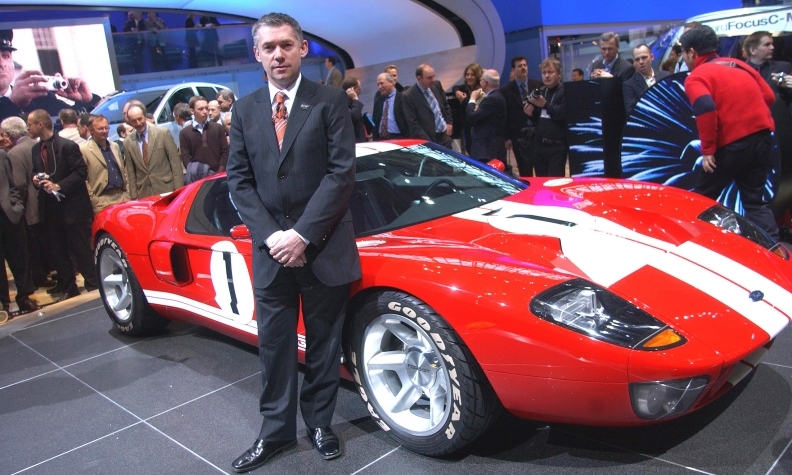 Martin Leach, pictured at the Geneva Motor Show in March 2003, has been hired to build a global automaker. FRANKFURT/DETROIT (Reuters) -- A group of deep-pocketed China-based internet entrepreneurs and financial investors, including Tencent and Hillhouse Capital, is backing an effort to create NextEV, a new rival to U.S. electric car maker Tesla Motors Inc.
Hillhouse is also an investor in Uber, the U.S. ride-sharing service. The backers have hired ex-Ford Motor Co. executive Martin Leach to build a global automaker, a NextEV spokeswoman said today. The backers have also recruited experts with previous experience at Tesla, BMW AG, Volkswagen AG and other major car companies. The NextEV investors are among several Chinese technology entrepreneurs with little or no automotive background who are hoping to create new electric car companies. The effort is supported by the Chinese government, which recently changed rules to encourage investment by non-automotive companies. Among the Chinese tech companies that have announced or are considering investments in electric car ventures are Alibaba, Xiaomi Technology and Leshi. Tesla spokesman Ricardo Reyes said today: "We're happy to see other people use the Model S sedan and our business model as benchmarks, whether they are large companies or well-funded startups." The creation of Shanghai-based NextEV, which has established offices in Europe and the United States, is a sign that a gradual shift toward electric vehicles has lowered the barriers to entry into the auto industry. The Chinese government has also provided generous incentives to encourage production and sale of EVs. "The first model launched by NextEV will be an electric supercar," NextEV spokeswoman Jili Liu told Reuters. "This EV supercar is expected to outperform all combustion (engine) supercars in the world." The sportscar is expected to debut in 2016. It will be designed to produce more than 1,000 horsepower and accelerate from 0 to 100 kilometers an hour (62 miles per hour) within 3 seconds, Liu said. A range of high-performance family cars will follow. NextEV Co is being backed by Chinese internet company Tencent; William Li, the founder of internet content provider Bitauto.com; Xiang Li, the founder of automotive website autohome.com.cn, and Richard Liu, the founder of e-commerce site JD.com. Hillhouse Capital, which was started with seed money from Yale University, is also a backer, NextEV said. Leach, the former COO at Ford of Europe, is currently spearheading efforts to recruit hundreds of staff to work in San Jose, Calif., Shanghai, Munich, Beijing, Hong Kong and London, Liu said. Leach's role is co-president, Liu said, declining to elaborate further on the leadership structure of the new car maker. Among NextEV's hires are Danilo Teobaldi, the former chief of vehicle concepts at Italdesign Giugiaro; Juho Suh, a former senior designer at BMW, and John Thomas, a former senior program director at Tesla, according to their Linkedin profiles. Thomas, who also worked as an engineer at Ford and General Motors, helped lead the development in 2006-2008 of the Tesla Model S.
NextEV did not want to disclose the extent of its financial backing, saying it preferred to keep such details confidential. The company will initially target China as a market and move beyond that at a later stage, Liu said.